The Top 10 Best Peruvian Dishes date back to the Incas and pre-Incas, utilizing maize, potatoes and spices, and then subsequently influenced by the arrival of the Spanish colonies. Throughout the years, it incorporated the demands of the different groups of migrants, including Chinese, European, African and Japanese. 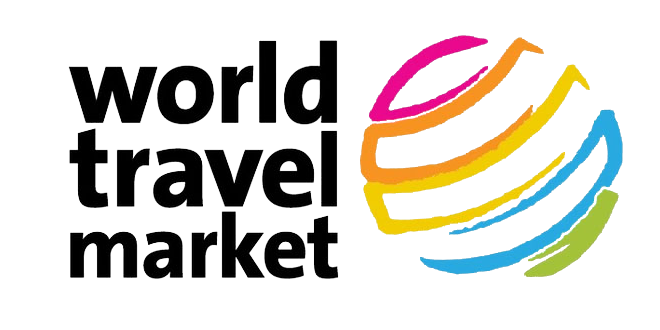 Nowadays, Peru is home to a variety of many delicious dishes, making this country one of the top and most unique tourist destinations in the world. 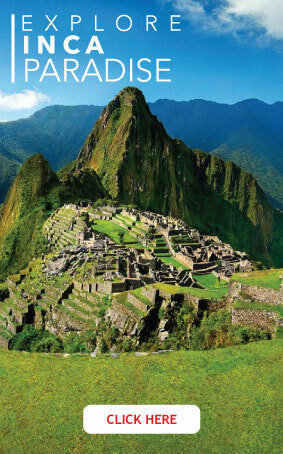 You can taste the rich history and culture of the Peruvian people in each dish. We’ve compiled a list of the best Peruvian dishes to help you dive into flavors of authentic Peruvian food. Indisputably Peru’s flagship dish, visitors can try this versatile cured raw fish classic pretty much anywhere in the country, from humble street carts to fancy restaurants. 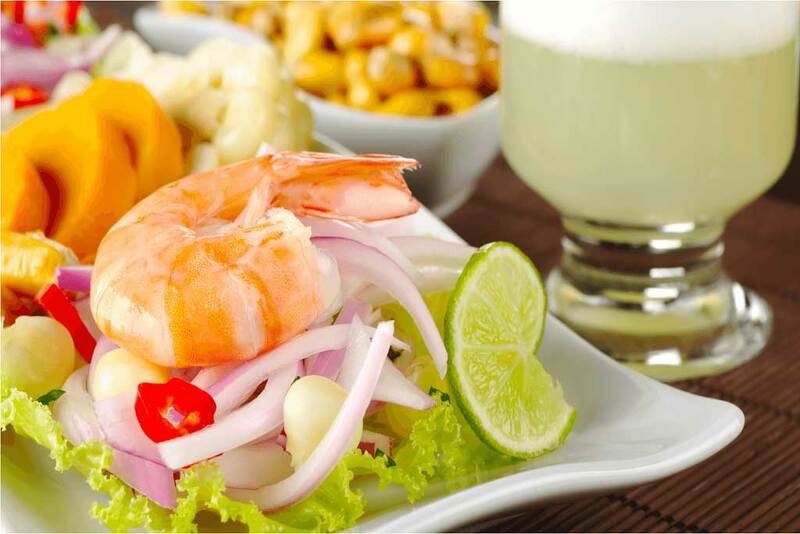 Peruvian ceviche is a cold soup made of fish, red onion, garlic and lemon. It’s a dish that will definitely amaze you. 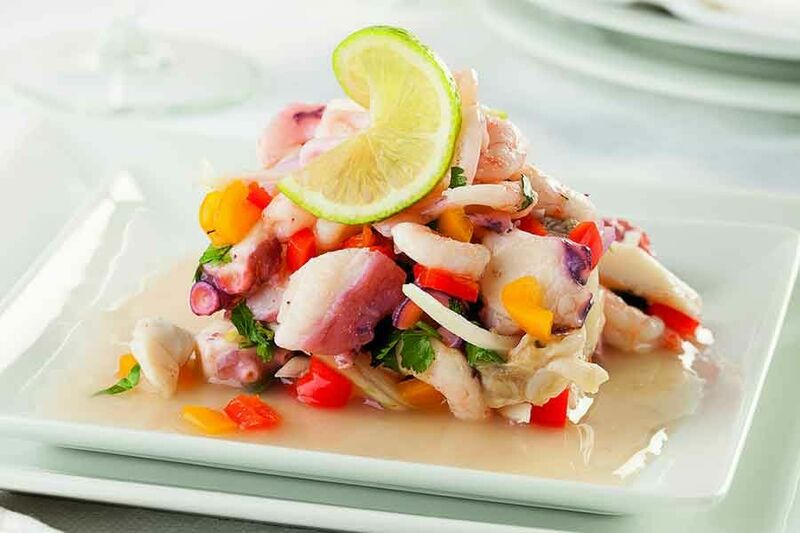 If you’ve tried another country’s ceviche, such as Ecuadorian ceviche, you’ll notice a unique preparation. 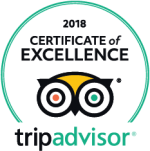 Once you try the ceviche, there will be no question why ceviche is such a popular Peruvian food. This is a traditional croquette eaten in Peru along with several other Latin American countries. This dish has a unique history, and has its roots in the 1879 War of the Pacific, where soldiers needed something portable to carry with them on long journeys. It is made by stir frying a spicy ground beef mix composed of ground beef, onions, tomatoes, cumin, garlic and paprika. The dish didn’t quite resemble what it is today, due to limited ingredients; however, upon returning home, many wives began to spruce up this new dish. 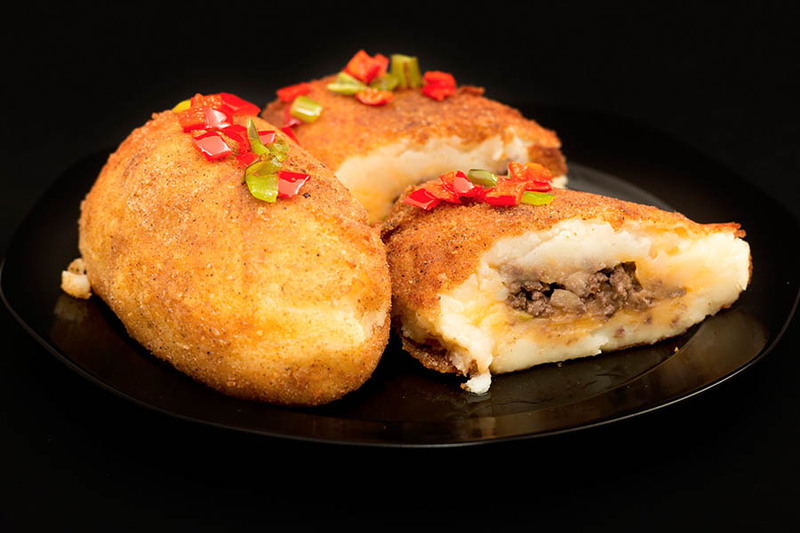 Coupled with influences from French and Italian cuisine, Papa Rellena quickly became one of Latin America’s favorite dishes, particularly for Peruvian gastronomy. 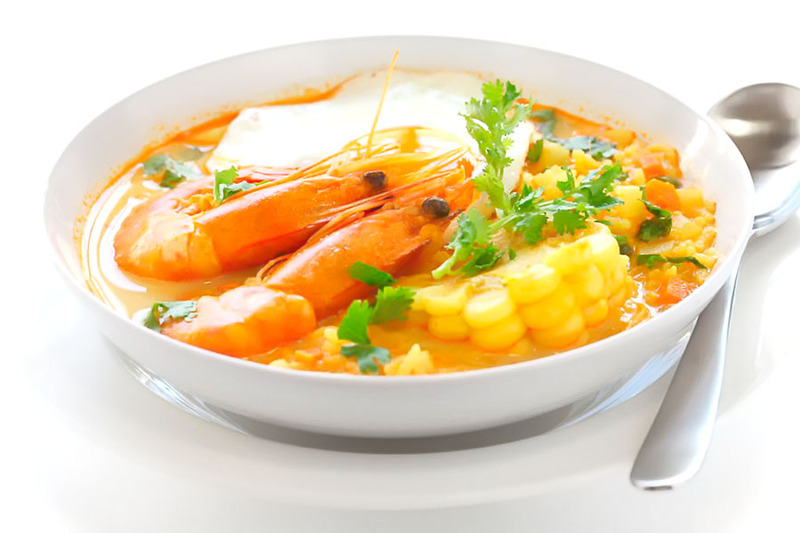 Chupe de Camarones is a unique Shrimp soup that combines a spicy broth with chunky vegetables, poached eggs, and lots of tasty shrimp. Shrimp chupe was a soup that the indigenous Incas in Peru had been making for ages, but it was only when the Spanish settlers introduced eggs and milk into their diet, in the early 1800s, that chupe de camarones began to evolve into the shrimp soup that we all know today. Each region of Peru has their own version of this soup, and they vary slightly from one to another, but the most widely known version of shrimp chupe is originally from Arequipa, in the southern coastal region of Peru. This soup is typically served during the winter, as a main dish. This makes sense, as it is hearty and chock-full of fun and tasty ingredients. This dish is also known as “Adobo de Chancho.” It is a traditional dish cooked overnight, and very popular to cure hangovers or for Sunday brunch. Though typical of Peruvian cuisine, Arequipa’s adobo is quite different from the other adobos around the world. 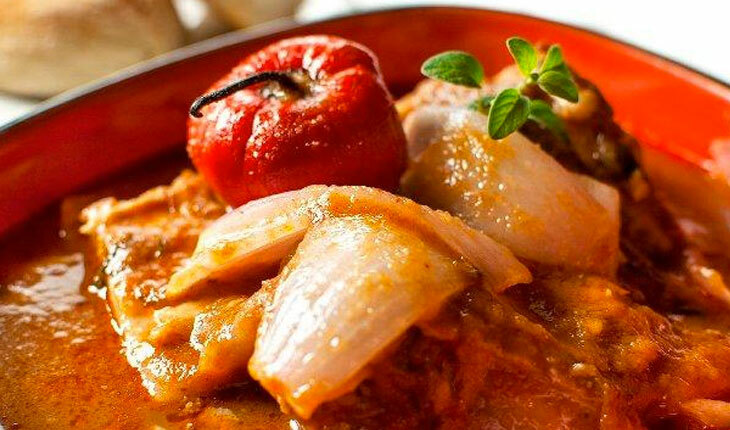 The dish is a soupy pork stew, slow-simmered with chicha de jora, spicy rocoto pepper, aji panca, garlic, onions, oregano, cumin, and other herbs and spices. Adobo originated in the eighteenth century, according to data collected from the archaeological sites of Arequipa. Chicharron de Cerdo includes pieces of pork with the skin on, cooked in pork grease with water flavored only with salt. 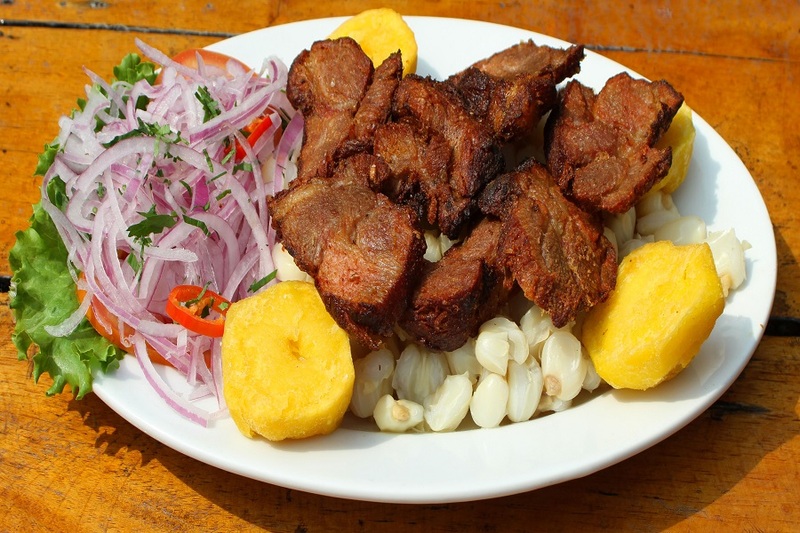 The history of Peruvian chicharron is a little uncertain, but it is very likely that the dish was brought and influenced by the Spanish, as they had the tradition of raising pigs. Historical data show that Chicharron became more common in Peru around the 1930s. 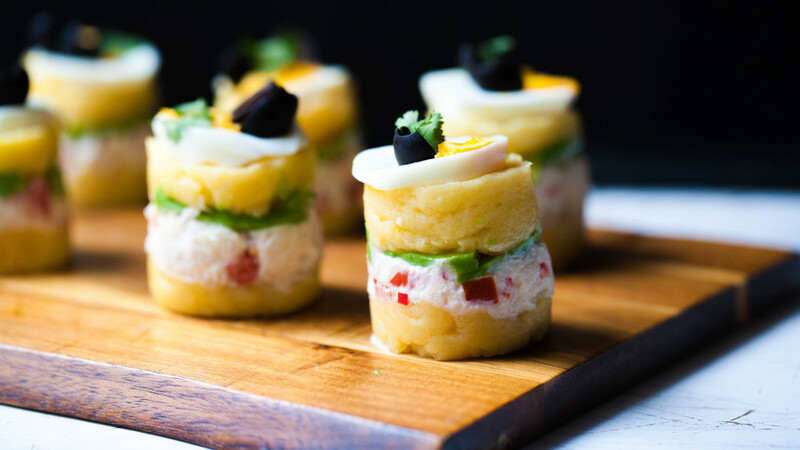 Peruvian causa limeña is similar to a potato salad made of potato, lemon, garlic, salad dressing, cooked egg and black olives. It is considered a perfect picnic recipe. Causa is the name from the old Incan Quechua word, “Kausaq,” which means “giver of life;” another name for potato. Rellena is the Spanish word for “stuffed” or “filled.” A popular alternative way of eating Causa is rolled up like a jellyroll, spreading the potatoes into a smooth rectangle over a layer of plastic wrap, lifting the plastic wrap from one end of the potatoes and rolling the potatoes up over the filling. 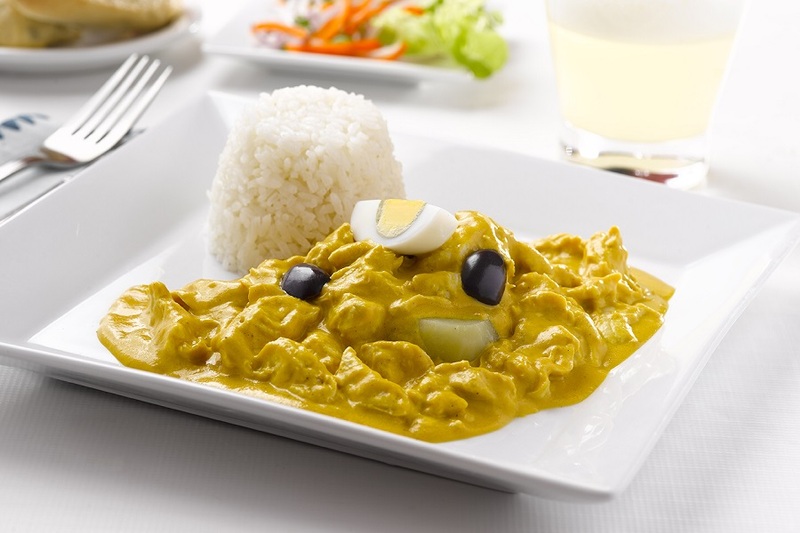 Aji de Gallina (Creamy Chicken) is a classic Peruvian dish composed of a shredded chicken stew in a flavorful cheesy sauce made of ground walnuts and aji amarillo peppers. This is a dish that was born from the mixture of flavors and has as ancestor the white delicacy (manjar blanco). Therefore, it could be said that it originated in Spanish, French and Arabic cuisine. Ají de gallina should be served over potato rounds, accompanied by the olives and eggs cut into quarters. Quechua for “earth oven” or “earth pot”, Pachamanca specifically refers to the technique of cooking the food underground with hot stones, as the dish can be made with many variations of Andean ingredients. 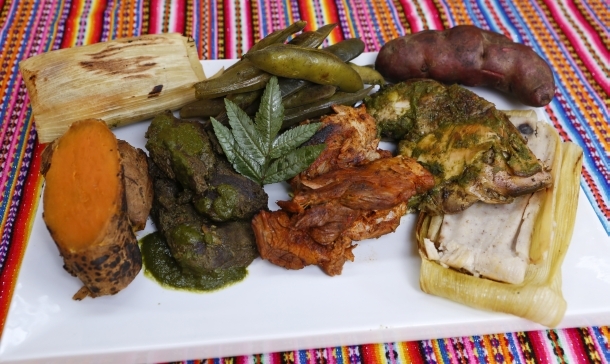 These usually include several types of marinated meats native to the highlands, such as lamb, goat, pork, chicken, alpaca or even guinea pig (called “cuy” in Peru). Sometimes a whole animal is cooked! Vegetables such as potatoes, green lima beans, sweet potatoes, yucca, corn, tamales, humitas and chiles are also included.